Extraterrestrial Live is the third live album released by hard rock group Blue Oyster Cult and is from the Fire of Unknown Origin tour in 1981. Their first live album, On Your Feet Or On Your Knees is a must-have classic if you’re a fan of hard rock and heavy metal. The second is a big seller but I prefer this one album to Some Enchanted Evening, even in its extended format. I haven’t heard this live album yet. I need to be convinced that I need it as well as On Your Feet and Some Enchanted Evening. Here is Blue Oyster Cult performing Veteran Of The Psychic Wars live in 1981. They like it at Amazon too. Love it or hate it? leave a comment to share your opinion. Is it the best Blue Oyster Cult album recorded live? Vote in the readers poll and see what others think. 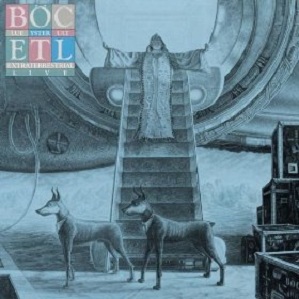 Extraterrestrial Live is the third live album by Blue Oyster Cult to be nominated in the readers poll to find the best heavy metal and hard rock album. This entry was posted in 1980s Live Albums, Heavy Metal Live Albums and tagged 1980s hard rock, 1981 live albums, Blue Oyster Cult Live Albums, heavy metal 1981 by Paul Simister. Bookmark the permalink.